The story of an early computer game by John Anderson. The Space Age had just been birthed. Sputnik was a new and somewhat omnious presence in the evening sky - my father tells me he carried me to the roof of our apartment building to see it. I don't remember. The year was 1958, and I was two years old. Dave Ahl, my boss, was a high school student. He had won a scolarship, one benefit of which was a tour of Brookhaven National Laboratory in Upton, NY. Something he saw on an oscilloscope there remained fixed in his mind for many years, and caused, among other things, a recent pilgrimage of my own. Nearly 25 years after the fact, I found myself on the Long Island Expressway. I was trying to pass an eighteen-wheeler spewing gravel off its trailer, while I looked for the Brookhaven exit. It occured to me that the Lab was hardly a stone's throw from Shoreham Nuclear Power Station, that controversial patch of multi-billion-dollar poured concrete. I wondered if the proximity was mere coincidence. Brookhaven is a government installation, and I felt nervous at checkpoints. The guard at the gate had a familiar kind of hypertensive bearing. I wished then I had shaved that morning. I proffered my press card with clammy draw. He told me to pull my car off to the side; I knew the jig was up. I was a spy, an agent, a saboteur, and it was all over. He handed me a piece of paper and said those chilling words: "Have a nice day.". Upon inspection, the paper seemed to be a visitor's map. My adrenalin level began to subside. It's really very simple to get to the Department of Nuclear Energy. You make a right near the linear accelerator, and pull into the lot next to the alternating gradient synchotron. If you see the tandem Van de Graff, you've gone too far. From there, only one flight of stairs separates you from one of the great, unsung heroes of our time, Willy Higinbotham. There was Bell, there was Edison, there was Fermi. And then there was Higinbotham. Willy was responsible for the display Dave saw on that fateful day in 1958. Willy, you see, invented the video game a computer game. We've received several manuscripts which attempt to set the record straight on the history of the video game. If you claim and can document a video game predating 1958, let us know. Otherwise, give Willy Higinbotham his profound and historic due. Much to the chagrin of large corporations involved in current litigation, he did it first, and he has proved it. Note by David Winter: this is definitely wrong all the way. The earliest game to display on a cathode ray tube was Thomas T. Goldsmith Jr. and Estle Ray Mann Target Shooting game created in 1947 and patented in 1948. Not only this game used X/Y plotting on a CRT like Tennis For Two, but it even used overlays. Another CRT game was created by A. S. Douglas in 1952: Tic-Tac-Toe on the EDAC computer. Though he stands about five feet four inches tall, Mr. Higinbotham commands quite a stature. He very nearly chainsmokes unfiltered cigarettes, which he wolfs down with great voracity for a man of 72 years. His eye-glasses magnify to the point where his corneas seem as large as quarters. He laughs easily and likes to play the accordion, though he admits it's been a while since he's played at a party. And, as a physicist in the Manhattan Project, he witnessed the detonation of the first atomic bomb. Before we sat down to speak in earnest, Willy called an old friend, Dave Potter, and asked him to join us. Dave had worked with Willy on the original game designs. We adjourned to a conference room. As Willy got started, other scientists would wander into the room, find a perch, and listen along. "Isn't he something?" one of the scientists whispered. He sure is. Back in the 1950's, when tours of the Laboratory were first institued, they were rather static affairs, usually consisting of a group of photographs to depict some facet of research at the facility. Willy, who discovered his penchant for physics at Cornell and electronics at MIT, explained that he wanted to make his display more dynamic. Give it a little punch. Wouldn't it fill the bill, he thought, if we got some sort of little game going on a CRT, so visitors could have "hands-on" interaction with the hardware ? He and his associates fashioned a tennis game played on the five-inch screen of an oscilloscope. Digital computers were coming into their own in 1958; in fact, Willy's own Instrumentation Division was building one at the time. However his game contraption made use of an analog computer, one that used variable voltages rather than on-off pulses to represent information. To this was hardwired a nonprogrammable assemblage of electro-mechanical relays, potentiometers, resistors, capacitors, and "op-amps", short of operational amplifiers. Willy himself is the first to admit that the arrangement was rather inelegant. But he also points out that it worked. He did make use of some recently invented transistors as flip-flop switches - a harbinger of things to come. Willy simply did the job in the shortest time with whatever parts were handy. The result was a video computer game, something no computer, digital or analog, had been harnessed to do before. The screen display was a side view of a tennis court. It looked like an upside-down 'T', with a shortened stem. This was the "net". Each player held a prototypical paddle, a small box with a knob and button on it. The knob controlled the angle of the player's return, and the button chose the moment of the hit. A player could hit the ball at any time, providing it was on his side of the net. Gravity, windspeed, and bounce were all portrayed. For example, if you hit a ball into the net, it would bounce lower than a bounce off the "ground", and would eventually die. The game was simple, but fun to play, and its charm was infectious. Potter remembers the popularity of the game: "The high schoolers liked it best. You couldn't pull them away from it". He's probably remembering young Dave Ahl, staring at the screen with a little voice inside him saying "this could be something important". The ball and court lines were drawn and redrawn sequentially, at a rate that made for a flicker-free view of ground, net, and ball. This is an approach still used in game playfield display. However the method of ball manipulation was and remains unique. Without becoming too bogged down in explanations, consider the following. An oscilloscope is capable of generating cartesian coordinate displays. That is to say, a dynamic "graph" can be drawn, plotting the deflection of x or y proportionally ot the voltages inputs as x or y.
Higinbotham rigged up a circuit wherein the plot of these functions simulated the trajectory of a bouncing ball. Op-amps from a Donner Labs analog computer were used to generate this trajectory and to sense when the ball had struck the ground. When this occured, a relay would be thrown, reversing the polarity of another op-amp, so that the ball would reflect its path and "take a bounce". Primitive, but effective. 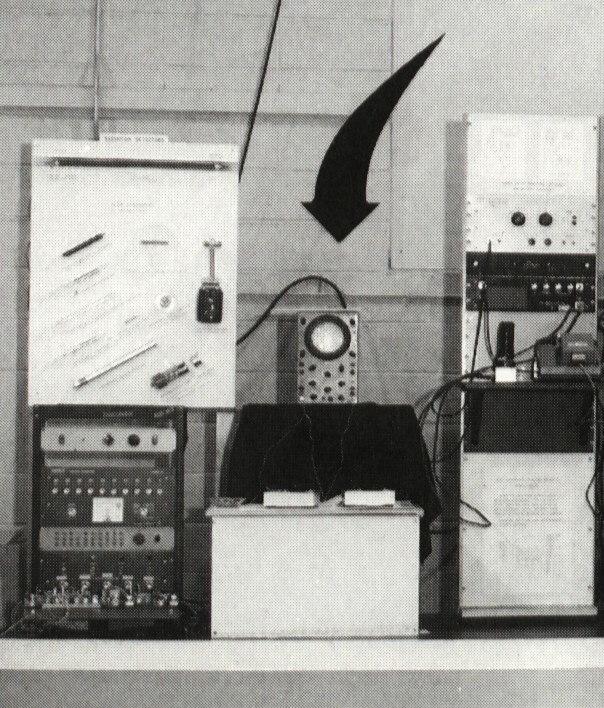 Other op-amps and relays were used to determine whether or not the ball had hit the net. As mantioned earlier, rebound velocity from the net was lower than from the ground, providing an extra bit of realism. Willy entered at Brookhaven National Laboratory in 1947, and called this video computer game Tennis for Two. He died at the age of 84 in 1994. Here is the Tennis for Two computer game. The oscilloscope is on the middle with the two controllers facing it. The Donner analog computer and game circuits are on the left. Photo courtesy of Brookhaven National Laboratory, New-Upton, York, USA. Credits: The Brookhaven National Laboratory (Upton, NY) for providing important information about the story of this game including the above picture and the Video Arcade Magazine from which lots of information were taken.